I bought this from an Ebay seller who described it as coming to him from a temple in Canton about 20 years ago. Quite how it came to him he didn't say! he believed it to be very old. The plate is 9.5cms in length and 7.5 cms in width, with a height of 1.5 cms. It feels quite weighty for its size and little bits of glaze have rubbed off at the edges mainly. 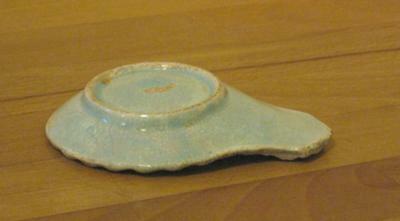 On the bottom of the plate is a fish shaped mark without glaze which may or may not be a mark. 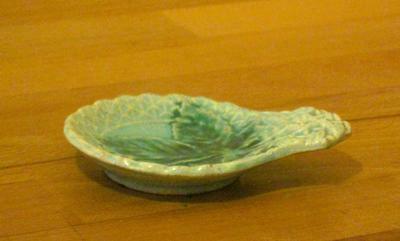 It is an unusual little plate/dish and I would love to know whether anyone might be able to identify it.